As I noted with the first version of this kit (No. 6675) a new gun was developed after WWI which became the famous 25 pounder. While its design had started in 1925, due to the efficiency (and prevalence) of the 18 pounder it was not until 1935 it was fielded. 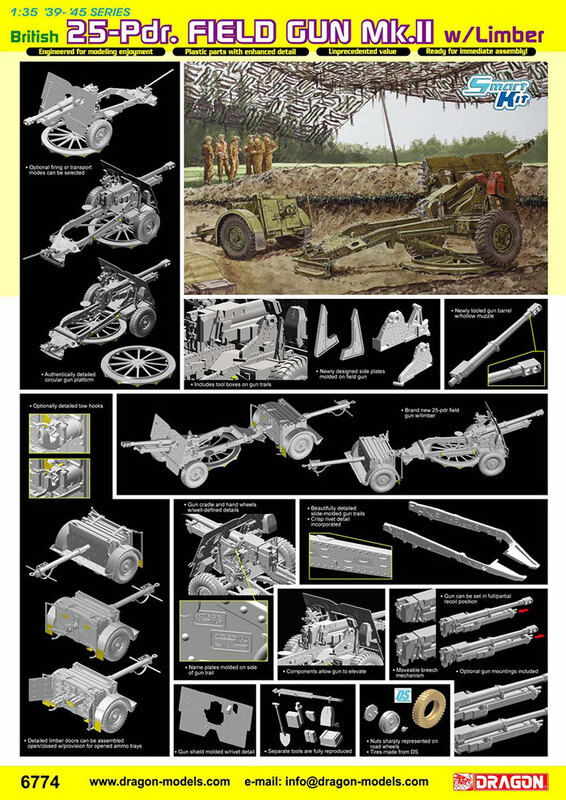 To save money during that time, the new barrels were mounted on redundant 18-pdr carriages as the Ordnance QF (quick firing) 25 pdr Mark I.
DML now offers the later version of the Mark II gun with its unique square two-baffle muzzle brake and other detail changes to the upper carriage; they replaced a sprue of 21 parts with two sprues of 32 parts. While it still includes the No. 27 trailer (limber) it no longer comes with a crew, but oddly enough now retails for $2 more than the original kit. 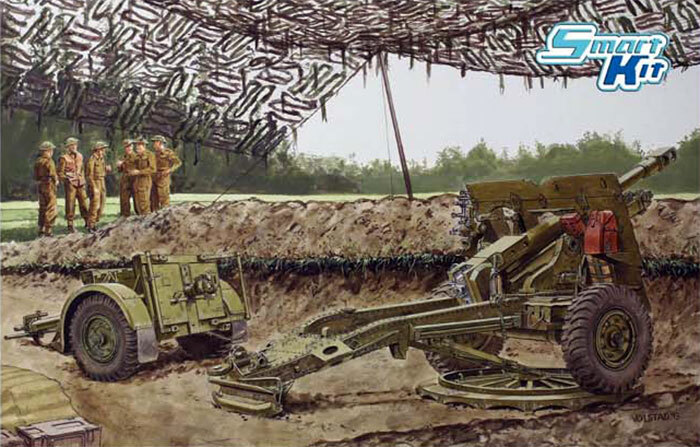 As previously citedit was based on pieces on display at “Firepower”, the Royal Artillery Museum at Woolich. From what I can tell from comparing the photos to the 1/1 scale example, DML appears to have hit all the marks. Steps 6-11 cover the assembly of the No. 27 trailer. This also has some options such as open or closed doors, two removable trays with brass details, and two different styles of hitch to connect to the gun lunette. The wheels even come with separate handbrakes and activating arms. But unlike the original kit which had three rounds for the gunners to handle there is NO ammunition provided with this kit, which is a bit of a shame (don’t believe the box claim!). No decals are provided. Painting directions give two options: Unidentified Unit, North Africa 1943 (sand overall); Unidentified Unit, England 1943 (no color shade given but standard British green should be the shade). However, based on the “Firepower” guns (an early Mark II sans muzzle brake and the last one in service with the British Army) – lovingly restored to near original finish - there are a lot of details which need painting and are not called out. Most of the leather bags appear dark brown, the seat is varnished wood, as are the rammer and mattock and shovel handles, and the sights are either natural metal or black. DML needs to pay more attention to painting details. Overall this is a nice kit but has been compared with a similar effort from Bronco. Consensus is the Bronco kit has more details and a better No. 27 – but is a bit of a handful as it has a lot more parts and three frets of etched brass. The DML one is a very good effort – and much easier to build.